The Eastern District of Texas filed a lawsuit on Nov. 22 to block the Final Rule of the Department of Labor’s (DOL) Overtime Protection Rule, which did not go into effect Dec. 1, 2016. The court entered a preliminary injunction, delaying implementation of the Final Rule pending further legal proceedings in the future. 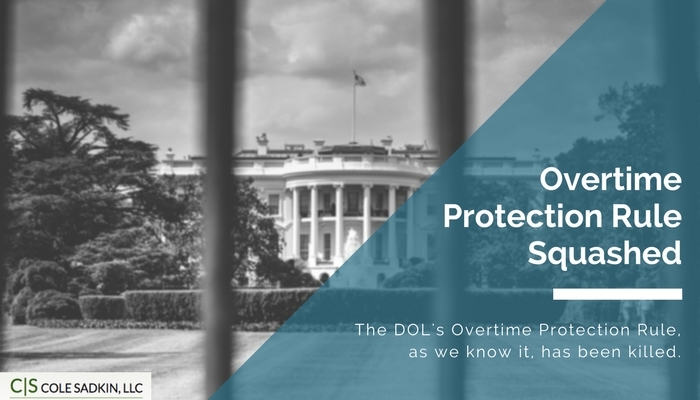 The Overtime Protection Rule was created under the Obama administration to update the inflation-weakened overtime rule which passed decades ago. For reference, the overtime protection applied to 62 percent of U.S. full-time salaried workers in 1975 but just 7 percent today. The new overtime rule would have mandated overtime pay for salaried employees who make less than $47,500 a year, which is an impactful jump from the previous threshold of $23,660. Under the new rule, more than four million workers would have become eligible for time-and-a-half pay. The Rule, as we know it now, was killed. It will reappear on the Supreme Court’s agenda in 2017 under the Trump administration. Significant alterations to the rule are imminent, as Trump has already expressed interest in wanting to make small businesses exempt from the rule, or have an additional delay in having to comply with the rule. Despite the lawsuit being filed in Texas, the injunction is nationwide in scope — it applies in all states regardless of whether they were involved in the injunction. The Dec. 1, 2016 implementation date for the Final Rule was postponed in all jurisdictions, and employers are not required to comply with the requirements of the Final Rule. Small businesses and advocacy groups across the United States breathed a collective sigh of relief as they have been expressing concern surrounding the additional costs and implementation of the new rule. The injunction will allow judges more time before making a final decision, which will take place under the Trump administration. Small business owners should keep an ear to the ground for any changes to the rule and the next time it is up for ruling.